British Marine, organiser and owner of the London Boat Show, today announced that the 2019 event has been cancelled on the back of poor industry support. The show was due to take place from January 9-13 at the Excel Exhibition Centre in London’s Docklands. 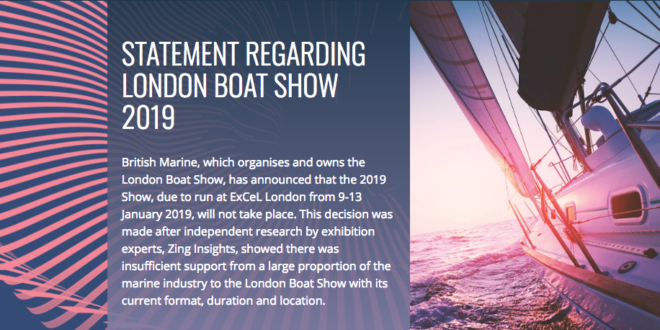 A statement released today by British Marine says the decision was made after independent research by exhibition experts, Zing Insights, showed there was insufficient support from a large proportion of the marine industry to the London show with its current format, duration and location. Zing Insights carried out personal interviews with over 67% of exhibitors over the last three weeks. “This revealed that whilst a number of marine companies supported the change to a five-day show, finding it preferable to a 10-day show, a large number of key exhibitors were not prepared to commit to exhibiting to a five-day show at ExCeL in January 2019,” reads the statement. British Marine’s exhibition sales staff have said that an insufficient number of signed contracts of commitment to the 2019 show have been returned – particularly from boatbuilders and boat retailers. Lack of signed contracts from this sector also affected confidence from other potential exhibitors, further reducing confirmed sign-ups within the deadline. “The decision to put the London Boat Show on hold is naturally very disappointing for the British marine industry, but British Marine and its Board of Directors has a responsibility to its members and we cannot commit to running a show which is clearly forecasted in its current format to be commercially unviable and will not meet customer satisfaction levels,” says British Marine president David Pougher. In contrast, ticket sales and exhibitor sign-ups for British Marine’s 2018 Southampton Boat Show are significantly ahead compared to this time last year. The show, which normally attracts close to 500 exhibitors and more than 106,000 visitors, runs over 10 days from September 14-23 and is celebrating its 50th anniversary this year. “TheYachtMarket.com Southampton Boat Show produces a positive contribution to the industry, is well supported by exhibitors and visitors alike and is a highly successful event and we are now able to put all our energy, expertise and enthusiasm into this event,” says Pougher. Putting the London Boat Show on hold for 2019 also enables British Marine to look at alternative options, he adds. “We are very aware that many companies in the marine industry look at a sales activity such as the London Boat Show in January as an excellent way to kick-start the year, but times change and we must do the same in order to offer events which are affordable, accessible, welcomed and supported by the industry and its customers, and are financially viable for all involved,” says Pougher.